Fleas and ticks are out in full force, be sure to stop in for your pet prevention. April 18 is Urine Analysis Day - the combination test will only be a charge of $5.00. It's heartworm prevention season - please make an appointment to have your pet tested. If you live in Wausau or the surrounding areas and need trusted veterinarians to care for your pets – look no further. Dr. Rebecca Myszka, Dr. Tim LaBarge and Dr. Chavalin Chadwick are licensed veterinarians in the state of Wisconsin, treating all types of pets. Your pets’ health and well being are very important to us, and we take every possible measure to give your animals the care they deserve. 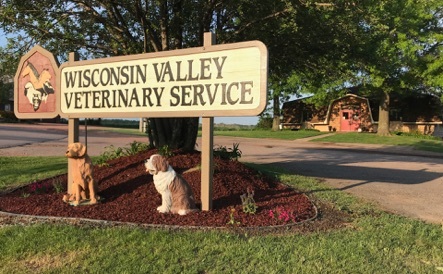 Wisconsin Valley Veterinary Service is a full-service animal hospital and welcomes both emergency cases to our established clients as well as pet patients in need of routine medical, surgical, and dental care. Dr.'s Myszka, LaBarge and Chadwick have years of experience treating serious conditions and offering regular pet wellness care. Beyond first-rate pet care, we make our clinic comfortable and calm, so your pet can relax in the waiting room and look forward to meeting our veterinarians. We are happy to offer a number of resources that enable you to learn about how to take better care of your pets. Please feel free to browse our site, particularly the informational articles. The best veterinary care for animals is ongoing nutrition and problem prevention, so becoming knowledgeable about preventative pet care is essential to the ongoing success of your animal’s health. If you have any questions, call (715) 675-9402. Our veterinary office is very easy to get to - just check out the map below! We also welcome you to subscribe to our newsletter, which is created especially for our pet owners. At Wisconsin Valley Veterinary Service, we treat your pets like the valued family members they are. Tim LaBarge, DVM complete his undergraduate work at Iowa State University in 1976 and obtained his Doctor of Veterinary Medicine degree from Iowa State University in 1980. Dr. LaBarge is especially interested in bovine medicine and bovine surgery. Becky Myszka, DVM completed her undergraduate work at the University of Wisconsin-Madison College of Agricultural and Life Sciences in 2004 and obtained her Doctor of Veterinary Medicine degree from the University of Wisconsin-Madison School of Veterinary Medicine in 2008. Dr. Myszka is especially interested in small animal and equine general surgery, medicine, and dentistry. Chava Chadwick, DVM completed her undergraduate work at the University of Wisconsin in 2006 and obtained her Doctor of Veterinary Medicine degree from the University of Wisconsin School of Veterinary Medicine in 2012. Dr. Chadwick is especially interested in bovine medicine, surgery, and reproductive ultrasonography. Amy Rakow, CVT completed her technician training at the Madison Area Technical College in 2004. Amy joined the WVVS staff in May 2006. She shares her home with cats, Oscar and George, and a dog, Izzy. In her free time, Amy enjoys knitting, quilting, reading, and gardening. Brittani joined the WVVS staff in April 2018. Brittani lives with her husband James and two children, Camille and Todd. She also shares her home with three cats, Clarabell, Jill, and Steve, and a dog, Bruce. Sue started working for WVVS in November 1977. Sue and her husband, Randy, have one son Jeremy, a daughter-in-law Cherrie, and two grandchildren, Riley & Caitlyn. Having grown up on a farm, Sue enjoys working with our large animal clients, as well as our small animal clients. Marilyn came to WVVS in January 1981. Marilyn and her husband Larry have 3 children: Scott (wife Michelle, grandchildren Ben & Sam), John (wife Kim, granddaughter Maia & Hannah), and Julie (husband Jered, grandsons Keegan & Max). She shares her home with one cat, Sami. In her free time, Marilyn enjoys spending time at their cottage, swimming, fishing, and bowling. Vicki has been with WVVS since 2007. She was born in Wausau but lived in Ecuador for 20 years. Vicki enjoys spending her free time working on her small organic berry farm, accompanied by her dog, Woody, and cats Allen and Colby. Linda has been with WVVS since Fall 2015. Linda and her husband Tom have 2 children-Tyler (wife Jen) and Tyler and 2 grandchildren. She shares her home with one cat, Marley, and one dog, Minnie. Linda enjoys spending her free time fishing, gardening as well as spending time with family and friends. Dillin was officially adopted from the Lincoln County Humane Society in July 2013. We originally were her foster family while rehabbing her from a burn injury, but quickly fell in love with her adorable face and sassy kitten personality. She had big shoes to fill as our new official greeter but quickly learned the ropes. Thank you, Dr. Krueger, for seeing my Parker the same day I called. He feels so much better. It is comforting to know I can get Parker into the vet pretty quickly when needed, and the care, compassion, and education at Wisconsin Valley Vets is excellent!!! Dr. Chadwick was great to meet and use as a resource. We are new to goats and she informed us, taught and recommended lots of information that we didn't know. She was a great resource and a pleasure to work with. Thank you!!! We have had other great experiences with our horses with the other doctors as well. Great practice!! They treat you and your pet as a person. they are very nice and able to help you with whatever you need. WVVS is the best. they know that your pet is family.